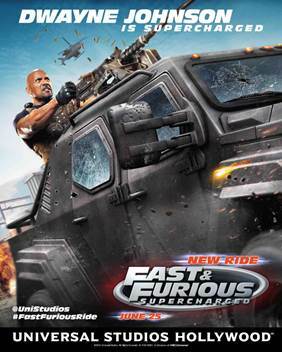 Universal Studios HollywoodSM continues its “Road to Fast” campaign with the debut of the Dwayne Johnson (“Luke Hobbs”) poster for its all-new thrill ride “Fast & Furious—Supercharged,” opening June 25 as the grand finale of the world-famous Studio Tour. A detailed look at the making-of this revolutionary new attraction, featuring commentary from the cast, including Vin Diesel, Dwayne Johnson, Michelle Rodriguez, Tyrese Gibson and Luke Evans and the producers, can be seen here. “Fast & Furious—Supercharged” is a technologically advanced, epic ride that reunites stars from the Fast & Furiousseries in a groundbreaking mega-attraction designed to catapult guests into the high-stakes underground world of street racing at perceived speeds in excess of 120 miles per hour. This high-octane ride is conceived as a new installment to theFast & Furious franchise and will debut as the grand finale to Universal Studios Hollywood’s behind-the-scenes Studio Tour that can only be experienced at The Entertainment Capital of L.A.
Join the conversation online using #FastFuriousRide, and for all the latest news, “Like” us on Facebook, follow us on Instagram and Twitter at @UniStudios.